Exactly what I was looking for,colors are very vivid and looks fantastic in my BoHo Home !! 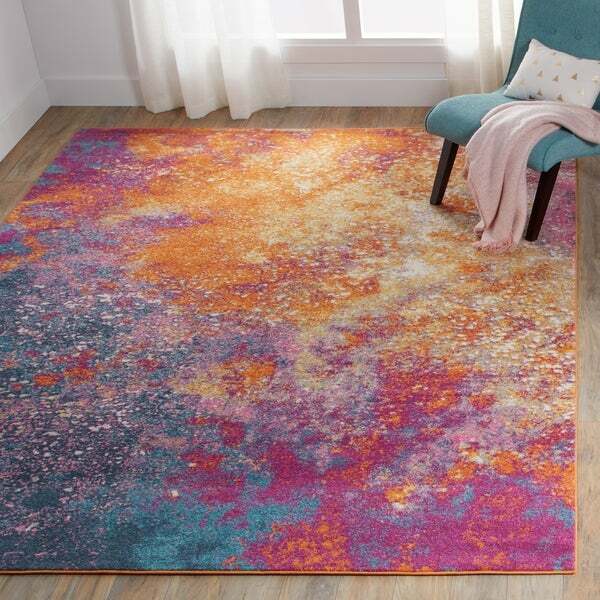 Nourison Passion Sunburst Area Rug - 5'3" x 7'3"
A sunburst of color creates movement and beauty in this dramatic area rug design from the Passion Collection. Magnificently hued and deeply pigmented, the saturated multi-colors seem imbued with light. Its radiance is a feast for the eyes and an unending pleasure in your favorite room. Dimensions 96in. x 120in. x .50in. The rug is gorgeous, the colors are spot on. It feels like it's a painting more than anything. It arrived nicely packed and it was easy to set up. It's soft on the touch and seems to be a good quality to it. I ordered this to put in my daughter's bedroom. The color is really make the room pop and it's soft for her to sit and play on. she's very happy that this is her new rug! 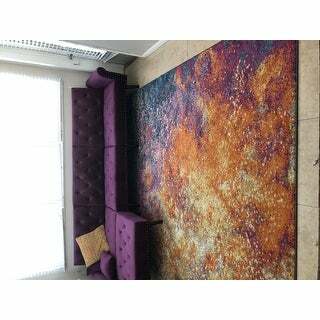 I really like this rug and it was a good price and cool design. It has more white in it than I expected based on the pictures. It's not a super luxuriant rug but it's so inexpensive, it definitely met my expectations. Shipping was FAST. Absolutely beautiful. I needed an area rug that contained an array of colors, pinks, greens, yellow, and ivory. This rug has worked out like no other rug could. The colors pop as soon as you come into the room. I love it. 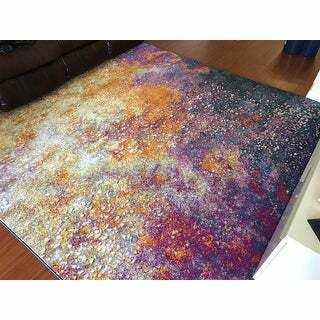 Love this rug, beautiful colors Love how the colors really brighten up the room. We replaced our previous cream colored rug in our play room with this one, life with a toddler can get messy and this rug definitely helps hide the little spills. Easy to keep clean. Beautiful rug. Colors are exactly as pictured. Bright, beautiful colors. it feels like what you expect with a normal carpet/rug. The reason I got this was because I thought it would hide stains and spills well and it has been doing just that so far. A lot of the colors are dark so whenever a spill or stain happens, it looks like it was meant to be there -- either dulling the color or making it brighter. We immediately put a no-slip mat down under the rug and it doesn't move at all WITH that, however we didn't even bother trying it without one. I've also rotated it under our couch a few times and everytime it gives the room a whole new feel because you see a different part of it. Great purchase, very happy with it. But it is loud and a statement piece, so if you have a lot of unique art, colorful couch or pillows, just be aware that this probably won't "blend in", it's a piece of art itself.. Bright vibrant colors and a soft texture. This is similar to standard carpet. Use of a dense rug pad definitely helps it to feel more luxurious. I picked this for our dining room to provide a pop of color. A bonus is that the colors are so varied the spills will hide easily. This went into my daughter's room and it looks so awesome! It matches everything due to the variation in the combination of colors. It's so beautiful you can get lost in the all the mixtures of colors and spots. Of every area rug that I've seen, I love this one this most; it's just so pretty and perfect for her room. 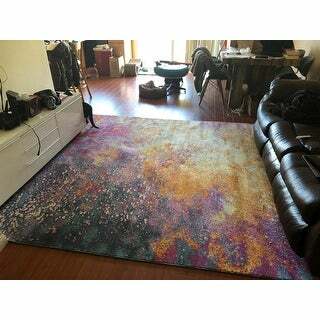 Amazing rug, the picture doesn’t do it justice. We have a more Carmel brown theme in our basement and this rug just brings the room together. The material will wear well also. Pattern is beautiful - great at hiding stains. Flattened out pretty quickly. You will need a pad for under though. Love the colors - goes with practically anything. I have to say the carpet looked A LOT better in the picture. The colores aren't as bright, looks faded in real life but somehow we are trying to make it work. I haven’t received it yet but I’m loving the price. I recently moved in with a friend and my new bedroom carpet is disgusting even after 3 times of shampooing. It might be a little colorful but i plan on balancing it out throughout the room. I ordered this rug for my girls bedroom and they love it. The colors are as vibrant as the photo and the rug is in great shape. It was on backorder when I purchased but still arrived almost week before the estimated time they had given me. I wanted a bright rug to match this couch, colors were exactly as pictured, very happy with purchase. Beautiful bright vibrant colors so much fun at beauty to any room. Lots of compliments. This is a gorgeous carpet. It is well made and the colors are bright, exactly as pictured online. It has been sitting in our living room for a few months now and we get compliments on it all the time when we have guests over. I bought one for another room in our apartment and love the colors and the workmanship. Well made and durable. Love the array of colors and the size for the price! "Does the rug slide around or would we need a rubber backing pad to help it stay in place. My husband uses a walker to get around and is on oxygen so he also has that long air hose hooked up to him 24/7. Thinking if it slides could be dangerous for him. Love the colors in the sun burst hope they are as nice as they look. " Nourison Passion Sunburst Area Rug - 6'7" x 9'6"
Nourison Passion Sunburst Area Rug - 3'9" x 5'9"
Nourison Celestial Atlantic Blue and Red Abstract Area Rug - 6'7" x 9'7"